Earlier today, as part of our ongoing reporting of the Ray Rice story, we sent a list of questions to an NFL official. Some of them were raised by the league's investigation of Rice, others by league commissioner Roger Goodell's lawyerly performance in an interview with CBS yesterday. Between then and now, Goodell sent out a memo to team owners and presidents that answers a few of the questions below and raises others. (When Goodell writes that the NFL "did not ask the Atlantic City casino directly for the video," for example, can we presume that means the NFL did ask for the video indirectly?) At any rate, we thought these questions would be worth putting out in public. If the NFL gets back to us with answers to them, we'll update the post. 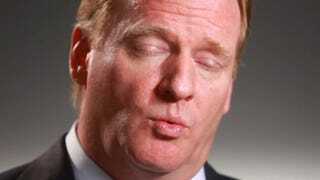 Roger Goodell said Tuesday that "no one in the NFL" saw the second Ray Rice video before Monday. Can you clarify exactly what "in the NFL" means? Would it include anyone acting as an agent of or at the direction of the NFL, but not employed directly by the league? Would it include anyone either employed by or acting as an agent of or at the direction of the Baltimore Ravens? What is the basis of Goodell's assertion that to his knowledge, no one in the NFL saw this video before Monday? Has he sent a communication to everyone employed directly or indirectly by the NFL asking if they saw this video before Monday? Did anyone acting as an agent of or at the direction of the NFL or the Baltimore Ravens see what was portrayed on the second video before Monday? Did anyone acting as an agent of or at the direction of the NFL or the Baltimore Ravens go to the Revel Casino at any point to view video footage of the Ray Rice incident? Was a description of the tape from inside the elevator ever given to an NFL official or anyone acting as an agent of or at the direction of the NFL? If so, what did that description entail? Did anyone acting as an agent of or at the direction of the NFL or the Baltimore Ravens request a copy of the tape from the Revel casino? Did anyone acting as an agent of or at the direction of the NFL or the Baltimore Ravens request a copy of the tape from the Atlantic City police department? Did anyone acting as an agent of or at the direction of the NFL or the Baltimore Ravens request a copy of the tape from Ray Rice or his attorney, Michael Diamondstein? Did anyone acting as an agent of or at the direction of the NFL or the Baltimore Ravens request a copy of the tape from the New Jersey state police? Was anyone acting as an agent of or at the direction of the NFL or the Baltimore Ravens aware of the elevator video's contents before Monday? Why was video of Rice punching Palmer unconscious considered "new evidence"? A criminal complaint stated that Rice had punched Palmer unconscious, and video was released in which Palmer is shown being dragged unconscious from an elevator. Multiple media reports existed that accurately detailed the events on the tape. Was Roger Goodell aware of those reports? Did Ray Rice's version of events match up with them? What, specifically, changed the league's mind about how Ray Rice should be punished after having seen the second video, given that its general contents were known both from publicly available documents and widespread media reports? Did Ray Rice's description of the events in the elevator mitigate his initial punishment? How? Were any women consulted in the NFL's decision to suspend Ray Rice for two games? Who is the highest-ranking woman in the NFL's investigative or disciplinary units?